More first-rate research from the OECD: “Economic Policy Reforms: Going for Growth 2010“. 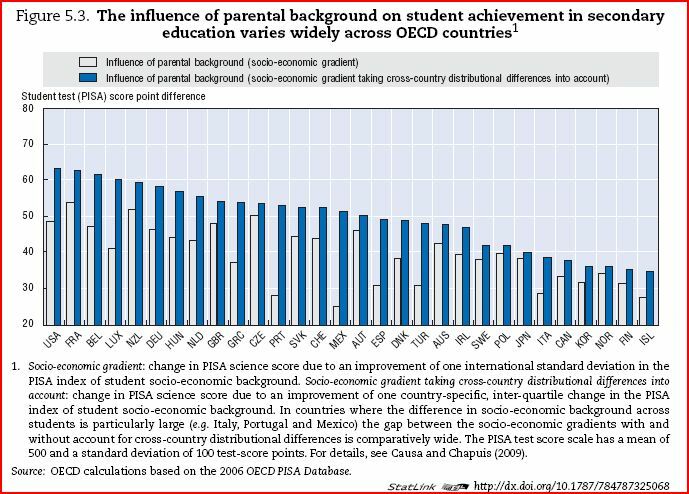 Of special interest to Americans is chapter 5: “A Family Affair: Intergenerational Social Mobility across OECD Countries“. Like the massive body of research preceeding it, this contracts one of the key myths about America. A nation that steers by myth, not reality, will eventually crash on the rocks. The authors carefully avoid pointing fingers or mocking us. They let the graphics tell the story of increasing inequality of income and declining social mobility — both washing away the foundations of the American Republic. Worry not about America becoming like Zimbabwe. Worry about becoming like Argentina. Next Post Is freedom the only value by which to judge governments? Much of America’s promise is predicated on economic mobility — the idea that people are not limited or defined by where they start, but can move up the economic ladder based on their efforts and accomplishments. 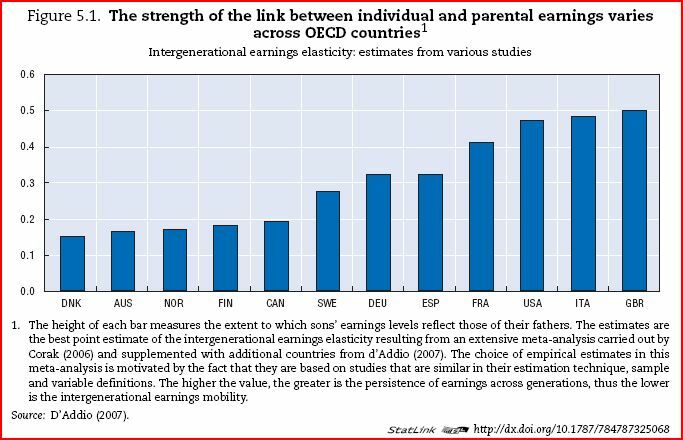 Family income mobility — changes in individual families’ income positions over time — is one indicator of the degree to which the eventual economic wellbeing of any family is tethered to its starting point. In the United States, family income inequality has risen from year to year since the mid-1970s; given this rising cross-sectional inequality, changes over time in mobility determine the degree to which long-term income is also increasingly unequally distributed. Using data from the Panel Study of Income Dynamics and a number of mobility concepts and measures drawn from the literature, this paper examines family income mobility levels and trends for U.S. working-age family heads and spouses during the time span 1969–2006, based on a post-tax, post-transfer concept of income adjusted for family size. By most measures, mobility is lower in more recent periods (1995–2005) than in the late seventies and the eighties (the 1977–1987 or 1981–1991 periods). Comparing results based on pre-government income suggests that an increasingly redistributive tax and transfer system contributed to rising mobility into the 1980s, but that its impact has since waned. Overall, the evidence indicates that over the 1969-to-2006 time span, family income mobility across the distribution decreased, families’ later-year incomes increasingly depended on their starting place, and the distribution of families’ lifetime incomes became less equal.